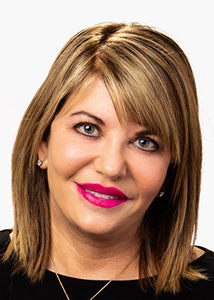 Dr. Lorrie Klein and our team of expert RN injectors at OC Dermatology will create the right treatment for you to plump, shape and redefine your lips and enhance your natural beauty. Dr. Klein is one of the most renown experts in the application of facial fillers and is a trainer for Botox and Juvederm products. Here at OC Dermatology we aim to rejuvenate your facial features and enhance lips for a luscious, beautiful, yet natural look and feel. A consultation is required to find out which fillers are right for you. A lip injection treatment can enhance lip volume for up to 12 months and longer for some treatments. For clients who request lip fillers, we recommend Volbella®, Vollure® or Juvederm®. Schedule a *free consultation by filling out the contact form or calling our location in Laguna Niguel, CA. *free consultations include a personalized skincare evaluation with our experienced nurses. A $75 fee may be charged for physician consults. Cosmetic Dermatologist, Dr. Lorrie Klein, is one of the leading Juvederm® injectors, not just in Orange County, but worldwide. 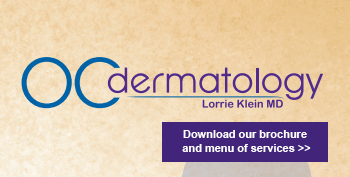 Dr. Klein is a national trainer for Allergan who educates other physicians on the proper use of Vollure, Volbella, Voluma, Juvederm, Kybella and Botox. She was the first physician in South Orange County and one of the first in the United States to have access to the revolutionary filler Juvederm Vollure XC. In addition, Dr. Klein has ranked as the #1 Juvederm and Voluma injector in Orange County. At OC Dermatology we offer a variety of cosmetic injectables that that can help you fight the natural effects of aging. 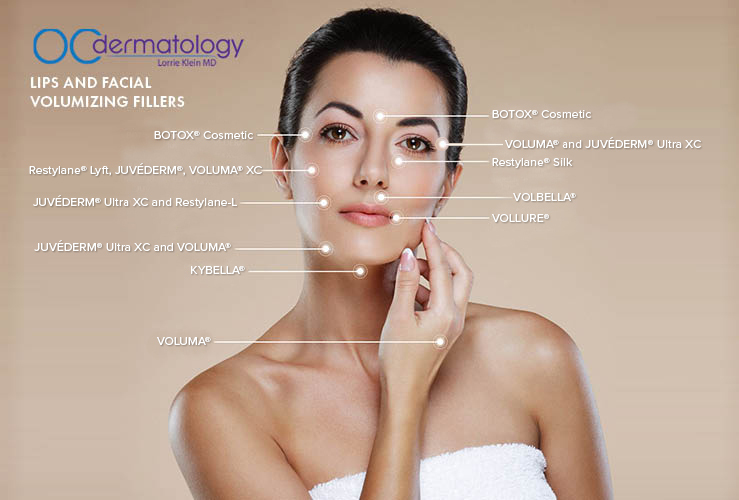 We will work with your facial features to recommend a plan to enhance the right areas. With all injectable treatments there is minimal discomfort and no down time. It’s time to look and feel your very best! Treatment areas include cheeks, lips, temples, brows, smile lines, downward corners of mouth, vertical lines around mouth, jowls, jawline, enhance chin profile. Multiple syringes may be necessary for optimal results. Why Choose the Juvederm® Family of Products? Juvederm® Ultra and Juvederm® Ultra Plus are 2 of the most popular dermal fillers at our Laguna Niguel location. Voluma is the first filler approved by the FDA to enhance cheeks that appear sunken. Juvederm Ultra XC, Juvederm Ultra Plus, Voluma, Volbella and Vollure provide patients with a natural, youthful appearance when injected by a trained professional with an artistic eye. The majority of experts agree that hyaluronic acid (HA) fillers are the products of choice for correcting slight to severe lines and wrinkles and adding shape to lips. The gels are created from stabilized HA, which binds with water to add volume and hydration to your skin. They slowly break down and are absorbed by the body naturally. Because HA is a natural substance found in our bodies, no allergy pre-testing is required. These products also contain lidocaine, a local anesthetic that increases your comfort during treatments.